Legoland California is one of several theme parks worldwide created by the famous toy company and specifically designed for children ages 3-12. Some rides and attractions are only for smaller children, and even the roller coasters keep a slower pace. It's one of the best places in California to take younger children for a fun day of play. Adults like the big LEGO block creations and the model cities in Miniland - and watching the kids having fun. The simulated factory tour is a must-see for the geeky engineer types in any group. Unlike some of the other theme parks in Southern California, Legoland is very clean and well-kept, something I appreciate. The kids will find a lot of things to bop and bounce, and plenty of rides and activities geared to their age group. Because of this, many rides have MAXIMUM age and weight requirements. About one-third of the rides have a minimum height requirement. Older kids who love thrill rides might be bored at Legoland - but you know your kids best. Older children might enjoy checking out the MINDSTORM robots or building a spaceship, though. What Is There to Do at Legoland? Rides: Legoland's rides are cute and relatively gentle. Where there are height restrictions, they can be as low as 36 inches tall. Some have maximum height restrictions, too - to keep them fun for the littler kids. Miniland: You've probably seen photos of the cute cities built entirely from LEGO blocks, like the one on this page. Other cities recreated in stacking blocks include San Francisco, New Orleans, New York and Washington, D.C.
Star Wars Miniland: Iconic scenes include the Death Star and Luke Skywalker flying his X-wing fighter through a combat zone. If the force is calling you to be creative, you can make Lego spaceships at the building stations near the Death Star. LEGO Friends Heartlake City: This girlfriends area is home to Mia, Olivia, Andrea, Emma, and Stephanie. Join them for sing-a-longs, visit the LEGO horse stables or ride the carousel. The LEGO® Movie™ 4D A New Adventure: This animated film follows characters Emmet, Wyldstyle, Unikitty, Benny and MetalBeard after they receive a mysterious invitation leading them to a new theme park where all of the rides are based on their film adventures. Sea Life Aquarium: It's nice, but if you're visiting Sea World or the Birch Aquarium during your trip, you don't need to see this one, too. Water Park: It's so cute it made me wish I was a kid again, just to play in it. Like the rest of the park, everything is set up with smaller children in mind. There's also a Legends of Chima section. There is an extra admission fee to enter the water park, and it's closed during cooler weather. 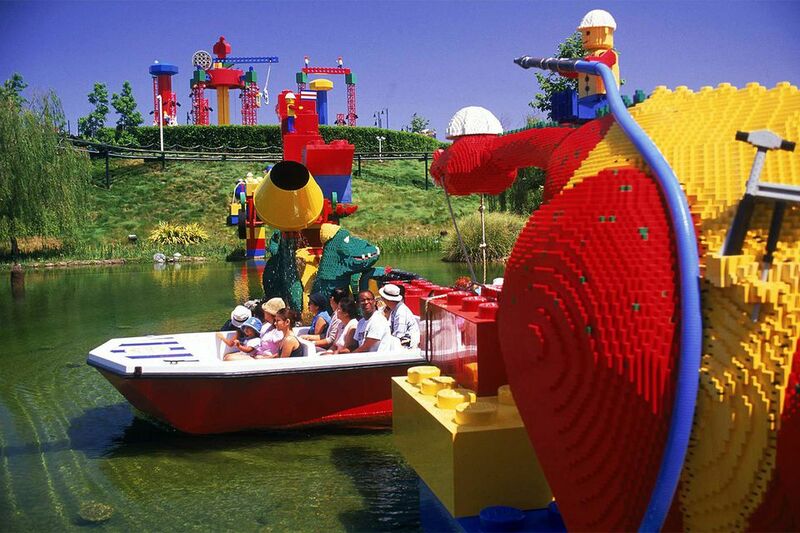 Add even more LEGO to your visit with a stay at the Legoland Resort Hotel. It's full of cute touches, has a breakfast buffet and evening movie night by the pool. A lot of people love it, despite its relatively high price. The Legoland Castle Hotel is located right at the main gate to Legoland. Each room has a LEGO Castle theme, there's a fun dragon den restaurant and bar, and lots of surprises like talking portraits and musical seats. Perfect for your knight, wizard or princess. If you want to get your Legoland tickets the easy way, just wait until you get there and buy them at the gate. If you'd like to save some money, and avoid standing in line to buy tickets, check the Legoland Tickets Guide. It has everything you need to know. You can't bring coolers and outside food into Legoland. You can take in food or beverages required for specific dietary needs. You'll find healthy food choices all over the park. Like all other theme parks, Legoland charges too much for bottled water, as much as four times what it might cost at a local grocery store. You can (and should) bring it in with you instead. If you're taking a toddler, Legoland's "What to do When You're Two" guide is a must-read. It lists activities suitable for the smallest guests. You can read it here. Pets are not allowed in Legoland California, and they don't have kennels. Service animals are of course the exception. Call 760-918-5346 to get a list of local kennels. During busy summer vacation and school holidays, arrive at least half an hour before the official opening time to avoid the rush. If you can't make it that early, wait at least an hour after opening time. On a busy day when lines are long (and sometimes slow), try riding at lunch time or during afternoon nap time. You can get current wait times on your mobile device at m.legoland.com. If your mobile phone's battery runs down, there are several locations where you can charge it for free. Just ask someone where to find them. Fun souvenir! You can buy Lego blocks by the pound at some of the gift shops. And they may also have kits that are hard to find anywhere else. You don't have to tote them around all day, either. Ask for package pick-up service, and they'll be waiting when you leave. Also fun is trading LEGO minifigures with park employees. Bring your own from home or buy one at the park and look for anyone who has a minifigure on their badge. If you're interested in LEGO Mindstorms robots, you can get a hands-on tutorial. To reserve a time slot, go to the MINDSTORMS building in the Imagination Zone as soon as you arrive. The Funland area has lots of water rides and activities, and chances are, everyone will get wet. Family-sized dryers nearby can help, but you have to pay to use them. A better idea may be to choose clothing that dries quickly, bring a change of socks and go early enough in the day that you won't get cold before you dry out. You may have heard about the apple fries at Granny’s in Castle Hill. The French-fry-shaped apple sticks are deep-fried, coated in cinnamon sugar and served with vanilla whipped cream. A lot of people think they're delicious, but they are too sweet for my taste. Even though one portion looks small, it may be enough for 2 to 3 people. If you want extra whipped cream, they'll charge you for it. If your kids get lost, they'll end up at a Lost Parents location. Any employee can help you find them. At Guest Services near the entrance, you can pick up an identification wristband, which will make it easier for you to get back together. You can also make your own wristband - or some parents just write their mobile phone number on the child's hand or wrist with a felt-tipped pen. Hours vary by season. Check the current schedule. Legoland closes during bad weather, and the water park closes from fall through spring. Legoland is about a 45-minute drive from downtown San Diego if there are no traffic jams.